Infrastructure design projects typically require a collaborative effort among the stakeholders like the client, designer, and contractor. For many design firms, a team of specialists are assembled to tackle these projects. In the early stages of a project, designers would gather information from the client to understand the functional requirements and deliverables. In many projects, the study of vehicle operations, whether it is movement of goods or people, form an important part that could influence the efficiencies or safety in the final design or construction process. It is in these situations where the right tools for conveying ideas or exploring options could make a substantial difference to the final outcome. A survey carried out of attendees at a recent Transoft webinar to introduce AutoTURN Online, revealed that nearly 90 per cent of the survey participants agreed that being able to collaborate with other team members or stakeholders on conceptual design or design reviews where vehicle turning manoeuvres are involved, is a ‘somewhat important’ or ‘very important’ capability. 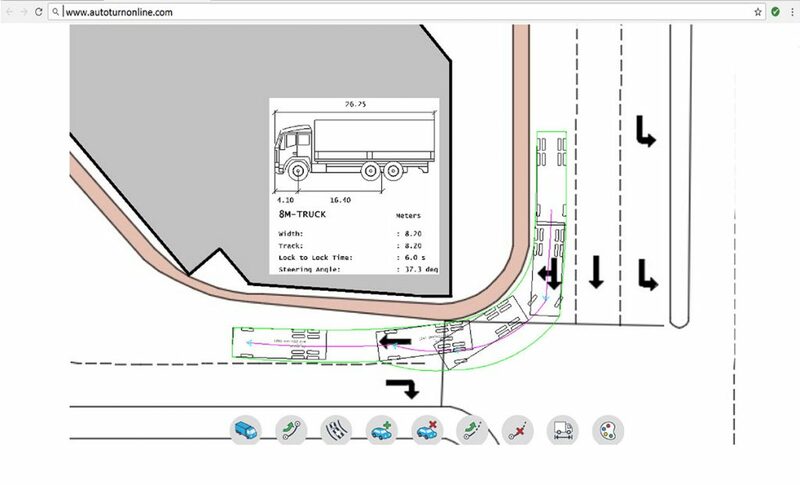 Many professionals, who do not use CAD regularly, or those who only conduct vehicle turn analysis operations infrequently, were named by respondents as the key beneficiaries of AutoTURN Online. The majority of attendess responded positively on the power of being able to convey the vehicle movements directly on a satelite image without the need to use any CAD platform (e.g. AutoCAD, Microstation, ZWCAD, Allplan, DATAflor, TurboCAD etc…). Having the right tool that can conduct such operations at anytime, anywhere, even for users without CAD software installed, could be hugely important in ensuring the projects can be completed quickly and accurately. This is where AutoTURN Online helps, as it is the first cloud-based tool of its kind that can be accessed through any browser on either PC or Mac. It offers much needed capabitilies to designers including flexible monthly or yearly subscription-based options to access design vehicles applicable in city, port, construction, and mining projects. If you can’t wait to give it a try? Head over to www.autoturnonline.com now and try it for free. When I tried to attend the webinar it’s already finished. Please let me know when and how I can attend the next webinar or can you please send me the video of it.